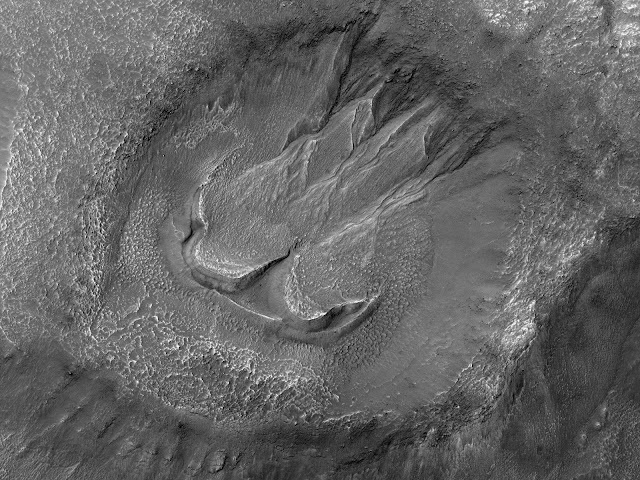 This crater has gullies on its southwest-facing walls and rim, as well as and what appears to be two separate instances of lobate (ear-shaped) material associated to its interior gullies. This observation is a "ride-along" with the CTX Camera, which has a much larger footprint, but lower resolution than the HiRISE camera. With much better resolution than CTX, HiRISE may be able to provide insight into the relationship between the features. This is a stereo pair with ESP_022540_1405. Note: This crater lies in the Nereidum Montes, which is the mountainous terrain to the northwest of Argyre Planitia.